It is hard to see how an alliance with Japan could be of benefit to India. The maiden visit of Indian Prime Minister Narendra Modi to Japan has been touted as the crown jewel in India’s East Asia diplomacy this year. 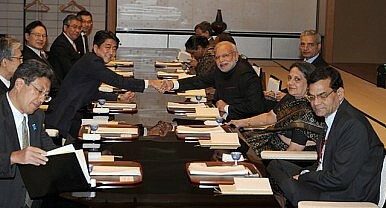 New Delhi not only secured unprecedented economic investment from Tokyo but also found a partner for economic growth. India’s need for a financial boost for its economy cannot be overstated and the trip has clearly bolstered bilateral ties. It is worth asking what benefits Japan reaps from these gestures towards India. The jury is still out on whether the bonhomie will pave the way for future security cooperation amid rising tensions in East Asia. Is this strategic partnership a harbinger of a future alliance? Can a New Delhi-Tokyo relationship evolve into a long-term security-oriented alignment? How is China positioning itself to counter such moves? Japan would certainly welcome more reliable investment and trade partners. Its difficult relations with China may have nudged it to look for other options offering similar opportunities. For India, this is good news, as it can now more confidently present itself to the world as the next best investment option after China. For his part, Modi ably flaunted the two assets India has that China does not: democracy and non-aggressive diplomacy. But an alliance requires certain common denominators. The most potent of these is geography. Countries that share land borders with a common hostile actor are more likely to join an alliance than island states are. In World War I, France and Russia did not need an added incentive to ally against Germany as its rise was equally threatening to both. An island state meanwhile has a natural buffer against invasion. Japan and India might have a common concern, but the ground on which a lasting alliance might be formed looks shaky. Japan is an island state, and as such its threat perception is different from India’s, which shares a land border with China. Geography would complicate relations and Japan would find it a burden to fulfill its alliance commitments to India. In any conflict scenario, India would be fighting a land war, whereas Japan would be engaged in naval conflict. The strategies and resources required would differ. In the domestic realm, it would be tough to convince Indians to fulfill a commitment to help Japan in a conflict with China, given the risk that doing so would invite massive Chinese retaliation. Japan and India helping each other would be complicated, not complementary. Finally, given the presence of the U.S. in the Asia-Pacific, for India and Japan to commit to a bilateral alliance would be redundant. Modi’s remarks in Japan attracted only a muted response from China. With Chinese President Xi Jinping arriving in New Delhi this week, China obviously does not wish to spoil the broth. It is also clear from its mounting investment in Gujarat that many foreign governments are keen to be on good terms with Modi. Rather, the Chinese media continued to target Japan for trying to woo India and sabotage China’s strategic interests. Modi has made economic development a priority. His business friendly stance represents opportunity for both Japan and China. And with deteriorating China-Japan relations, India is surely looking more appealing to investors. But India will have to balance its relations with these two countries wisely. As a neighbor, China must surely remain India’s priority. National interest will drive India to seek peaceful relations with China. In the meantime, closer defense engagement with Japan might be helpful in ensuring its longevity. This does need not be anti-China in nature (which India can ill-afford anyway), but rather a contribution to maintaining peace and prosperity in the region. India has attracted considerable interest in its economic development plans, to the benefit of its economy. It could also receive a military boost through groundbreaking openings in its relations with Japan. Meanwhile, Xi Jinping’s upcoming tour could potentially unlock the gifts China holds for India, leaving Modi to plan his next Look East move. It is best, then, to put to rest any debate over a potential security alliance between India and Japan. Such an arrangement would likely be detrimental to India’s long-term interests, forcing it to take a side. Swati Arun has a masters in international relations and an M.Phil in China Studies from Jawaharlal Nehru University, New Delhi and has worked with several think tanks. Alongside growing momentum for reconciliation, significant bilateral problems remain.